Del Sur empanadas get a lot of raves from Trip Advisor posters. 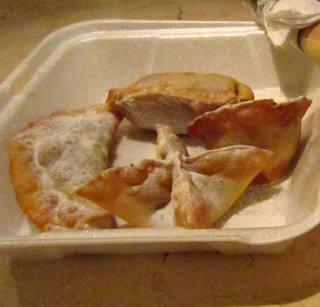 We dropped by after dinner one night to grab some dessert empanadas to go so we can enjoy them with a nightcap back at Playa Azul. What a nice place. We loved their decor, with plenty of heavy wood. We met the owner and chatted with him for a bit, about how he ended up getting into the business. Super nice guy. We shared most of the empanadas with our friends back at the hotel as I was concentrating on the marquesitas that we had also bought the same night, but I did try one the next day. Even though I had refrigerated it, the empanada was still delicious. This will also be on our list for future visits. Hook wants to dine here one night and try their grilled entrees.